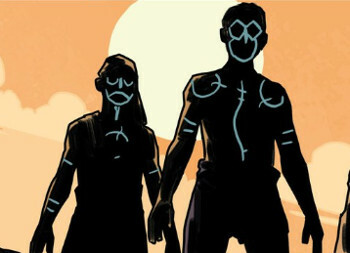 With issues 23 and 24 the Elders arc continues and heads towards the double-length final issue 25. The story takes some really unexpected directions and alliances and agendas are still far from being clear. Washington DC: CSM clone tells Scully Gibson’s story, then clones come? Gibson is described as “ascendant” alien, with his alien part progressively becoming stronger. He has revived the Syndicate for his own purposes, which are still unclear – however, they are described as “nefarious” by the First Elder and as a way “to continue” Mulder’s work by the CSM. What he does exactly is not yet clear. How all this deal with exposing the capturing Mulder advances his purposes is not clear either. CSM mentions that Gibson is trying to “impress” Mulder, and Gibson says that despite appearances all he is trying to be is a friend to Mulder. His side must be that of resistance to the alien invasion, however the was and means he uses are as twisted and mysterious as the ones of the old Syndicate. Gibson says, “These past ten years I’ve been left alone…I’ve discovered things…things only I can hear”. His plans have been brooding for a while. He warns Mulder of “the dangers of unfinished business and unintended consequences”: does he want to undo the errors of the Syndicate? What new elements have emerged in the past ten years that make action necessary now? Very appropriately, Mulder and Scully are scolded for retreating into their domesticated bliss for the past ten years while there was an impending colonization — living in the so-called Unremarkable House in rural West Virginia despite their knowledge of everything going on behind the scenes was one element that didn’t chime well with the mytharc in I Want To Believe. For the time being, everything that is going on is controlled by Gibson – and that includes the various attempted escapes of Syndicate Elders clones from Guantanamo and the organized escape of the CSM clone and Mulder, as odd as that sounds. Everything enters into Gibson’s grand plan. The CSM clone explains that Mulder has been “implicated in the theft of numerous digital files from the Bureau” — the X-Files, which must have been kept away from the public eye. Mulder becomes an unwilling Edward Snowden or Bradley Manning. From the official point of view, Mulder must have been imprisoned at Guantanamo for this betrayal, and his escape would both prove his guilt and make of him a fugitive at the eyes of the US government and a highly sought after individual. Accordingly, the CSM clones escape attempts and their mutterings of what seem like coordinates or directions (“Ten north…twelve east…Remember before”) are essentially trial attempts for the true escape attempt for Mulder. 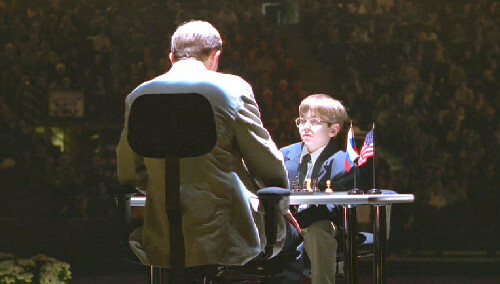 Now helpless and clueless, Mulder is a pawn in Gibson’s game. Joe Harris shows his love of twentieth century history and current political and foreign affairs once more with these issues. A large part of the story takes place in Cuba, and the recent warming of relations between Cuba and the USA after over five decades of more or less tense coexistence have been making the headlines. The Cuban economy might open to foreign investments, and surely US investors are not unhappy about that – the situation is summarized by the CSM clone in his own words, or those of someone ironically channelling Cuban revolutionaries, “exploiters who’ll squeeze profits out of proletariats”. The situation is not unlike that of the late 1950s when Cuba was a haven for US investments and tourists, until the revolution led by Castro gave the priority to Cuban interests. After 1959 came the 1961 Bay of Pigs invasion of Cuba by the US – in which the CSM participated in, as he reminisces here and in #10 – and the 1962 Soviet missiles crisis. Since 1903 the US has sovereign control over a small part of Cuba, the Guantanamo Bay Naval Base, which since 2003 includes the Guantanamo Bay detention camp, which became grimly famous in the 2000s for being where Iraqi prisoners of war or some key people accused with terrorism were tortured, either as a means of interrogation or by the soldiers themselves. Relations warmed again in 2015, towards the end of Castro’s life. As the CSM clone muses, “I’ve had my adventures on this island. And if a man lives long enough, apparently, he sees circles complete”. This highly secretive basis is an ideal setting for the X-Files, for an action piece akin to Mulder’s gulag adventure in 4X09/10: Tunguska/Terma. Gibson’s lab where the clones are grown are situated within the Guantanamo complex, which shows Gibson must already have very high access in the military hierarchy. The only thing that might – might! — have escaped Gibson is a conspiracy of resurrected conspirators. A CSM clone uses flashbacks from 5X20: The End to explain Gibson’s backstory and leads Scully on Mulder’s traces, and the First Elder and other Syndicate members abduct Skinner to use him against Gibson. 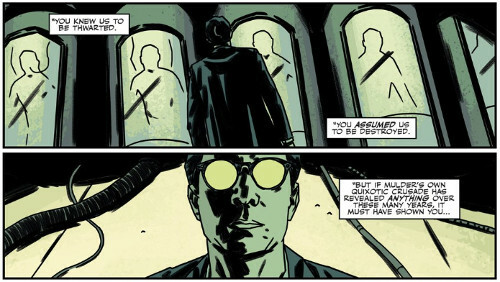 In previous issues Gibson made a big deal out of the fact that the Elders were always several steps behind him, and he often executed some of them for no other apparent reason than to make it clear that power now lies with him. The other Elders must be who were approaching where Scully and the CSM were discussing in Washington. A Scully-Elders alliance is an improbable one, but Gibson’s methods are not the most transparent ones. Following the CSM’s indications, Scully travels to Havana – in a sequence that could be reminiscent of Scully travelling to Puerto Rico in 2X01: Little Green Men. She is taken by Ignacio to a village close to the Guantanamo base, where she sees people wearing clothes with odd fluorescent patterns, discusses with a shaman woman that could have been the Navajo caretaker of the dying CSM in 9X19/20: The Truth, and finds out that people from surrounding villages have been abducted and experimented on. The experiments left green burns on them – an indication of hybridization experiments? Are they being used to be turned into hybrids, or as the base material for the Elder clones? Gibson then arrives at the village, obviously aware of the village’s situation: was he aware that Scully was coming and that some Elders are scheming against him? Mulder was stopped by who could turn out to be Ignacio’s people as well. After a Saudi adventure in Pilgrims, Harris brings our agents to Cuba, making their adventures grander in scope and keeping the X-Files in sync with current matters and relevant for the present day. The plot is cryptic as the mythology always is, the scenes presented in a cinematic way. Everyone could be headed for a reunion at the village, all is set for the final issue. This entry was posted on Wednesday, June 3rd, 2015 at 2:56 pm	and is filed under Comics. You can follow any responses to this entry through the RSS 2.0 feed. You can leave a response, or trackback from your own site.